This month was no different as we faced two huge challenges that required long hours and hard labour in hot, humid conditions. The start of the construction of our new jaguar cage and the annual preparation of our artificial turtle beaches were just two of the tasks we tackled. It seems that a lot of my news centers around our pioneering animal rescue center; and this is hardly surprising as the centre takes up a large amount of our time, but this month we have had great success that makes all the hard work worthwhile. Breeding animals in captivity is one of the toughest things to achieve in the field of conservation and so you can imagine our delight when one morning on our early inspection rounds we discovered that we had become proud parents once again. Our resident troop of red howler monkeys (Alouatta sara) produced a second infant just months after we lost the first one to a fall. The fact that the group has two reproductive females at such a young stage in their social development is a fantastic achievement and an indication of their relaxed surroundings, good diet, and spacious enclosure. Many of you might recall how years ago we struggled to raise orphaned howler monkey babies, as their diet is hard to replicate in captivity. It appears that we have got the strategies right as we now have a 100% survival rate with all the babies that arrive at the center and the fact that we already have breeding adults in our release group is very exciting. 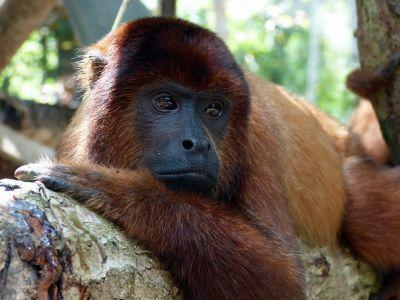 The howler monkeys, just like the spider monkeys (Ateles chamek), have strong social structures and successful releases depend on the group bonds being formed in captivity. There is no greater evidence that the group is well established than to have two females reproducing in the troop and with the others soon to reach adulthood the future for the group looks bright. As a precaution we have separated mother and baby for the first few weeks until the youngster is stronger and more agile as we do not wish a repeat of the accident which befell our first baby as the first-time mother was a little negligent in looking after the infant.